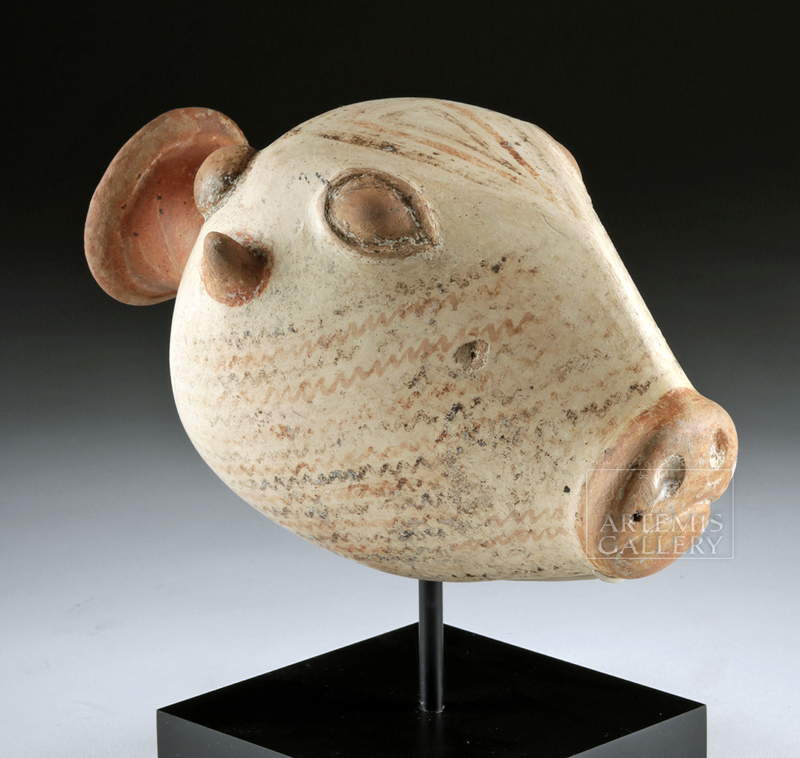 East Greek, Phrygian, Archaic Period, ca. 7th to 6th century BCE. Wow! 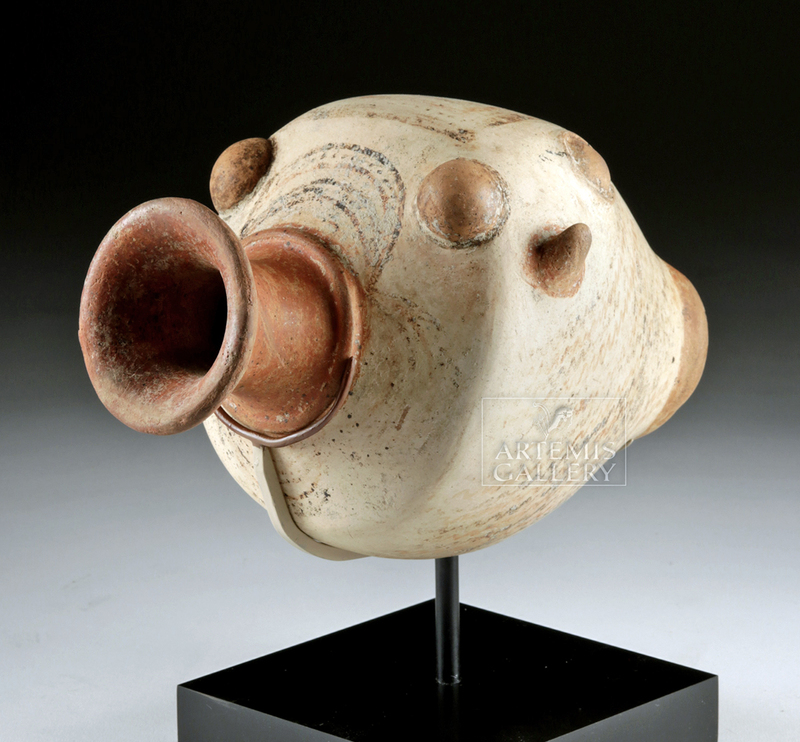 An incredible ceramic rhyton in the form of a painted bull's head, with a thin neck that flares out into a wide, rolled rim. 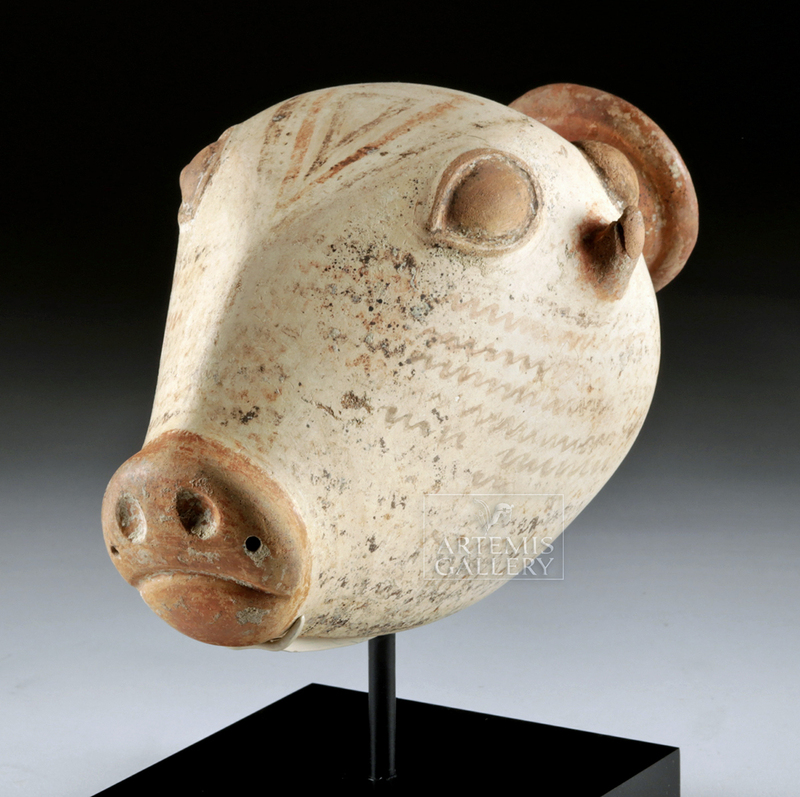 A thick bulge of pottery forms a border from the base of the neck to the wide body, which is abstract in form - the bull's head was clearly wheel-formed and then flattened into its current position, with a flat forehead, applied ears, eyes, and round dots for horns, and a broad nose with indented nostrils and an incised mouth. 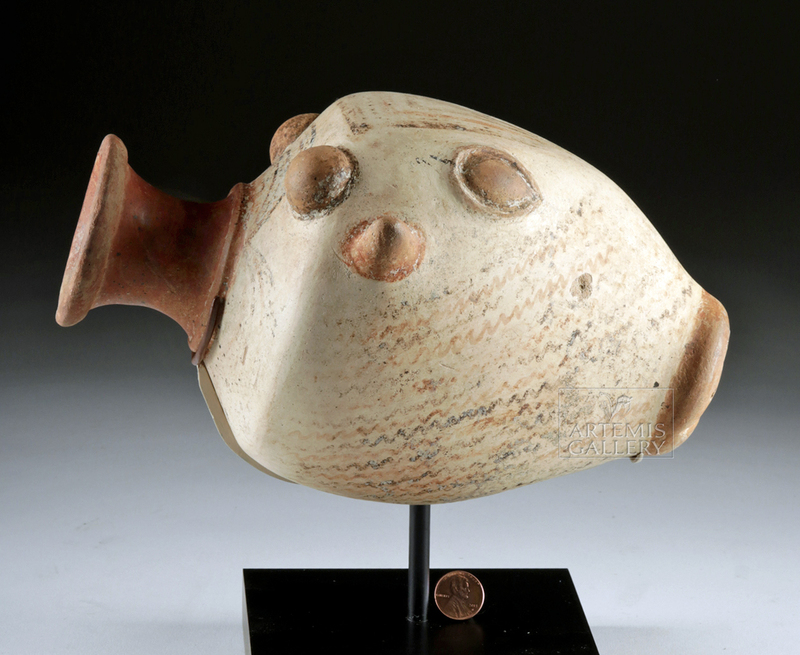 Earth red pigment colors the nose and these applied elements as well as the neck and mouth of the vessel. The forehead is decorated with concentric triangles in alternating red and black on a pale, creamy background. The fur is created by painted wavy strips of color that lies the face beneath the eyes. Size: 9.4" W x 6" H (23.9 cm x 15.2 cm); 8.85" H (22.5 cm) on included custom stand. Phrygia was a kingdom in the west central part of Anatolia, in what is now Turkey, centered around the Sakarya River. The Phrygians are most famous for their legendary kings of the heroic age of Greek mythology: Gordias whose Gordian Knot would later be untied by Alexander the Great, Midas who turned whatever he touched to gold, and Mygdon who warred with the Amazons. Rhytons like this example demonstrate the ancients' refined taste for special tableware, and this piece was probably used both as a drinking cup and as a pouring vessel to decant wine into drinking bowls during festive banquets. Zoomorphic forms like this one were popular throughout the Classical world, and bulls symbolized power, signifying virility and masculinity, qualities prized above all others in the Classical world. Condition: Restoration to rim; otherwise intact and in beautiful condition with light deposits on surface and nice remaining pigment. Small chips and losses from surface commensurate with age.